Walking and standing may be painful. 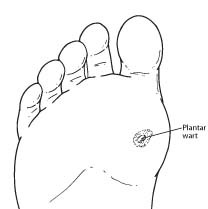 Squeezing the sides of the wart may also cause pain. These often appear on the surface of the wart. The dots are actually dried blood contained in the capillaries (tiny blood vessels).